Icoachsoccer.org has a special deal for visitors that order through Cardinal Publishers Group. Have you ever wondered why so many great goal scoring opportunities in the game of soccer are not converted into goals? 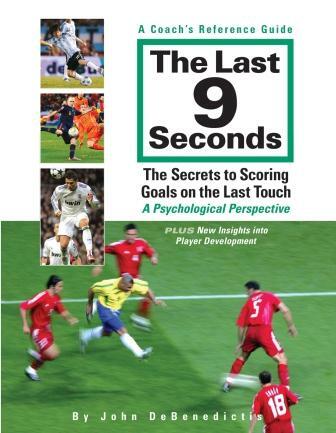 In this book you will learn The Secrets to Scoring Goals on the final touch, A Psychological Perspective, John DeBenedictis provides soccer coaches with solutions to this problem tackling it from a psychological perspective. This comprehensive volume is packed with hundreds of full color soccer photos and illustrations. How can a player who can kick, pass, shoot, or head a ball correctly, often miss a golden opportunity? In his book DeBenedictis stresses how to coach soccer players on an in-depth individual basis about how to prepare to score. He focuses on the psychological issues that players encounter in the final ticks of the clock prior to a goal scoring opportunity. This book is written for soccer coaches of players 13 years of age right up to Professionals. Since soccer is a low scoring game, one extra goal at the right moment can change a player’s or coach’s career. This book provides soccer coaches with unique mental training methods of coaching their strikers to score more goals on the chances that they get. It is based on DeBenedictis’ 20-hour Golden Goal Scoring course which has been proven to instantly make players better goal scorers. DeBenedictis writes with passion on the topic of scoring goals. Having played as a goalkeeper he knew exactly what it took to score on him. The book is a reference and instructional book for soccer coaches to use when their team or players are having problems scoring goals. He has studied this aspect of the game in great detail and has also included new ideas on player development and how young players learn. He truly deciphers the art and science of scoring goals. John DeBenedictis has been coaching for over 35 years and has coached at many levels. Most of his coaching has been at the youth level from the youngest of children right up to U21 league select teams playing in international competitions. He has been published in the NSCAA’s Soccer Journal. He ran his own soccer camps with Tony Waiters, former English International goalkeeper and Canadian National Team coach. He played goalkeeper for York University helping them win the National Title in 1977 and he also played in the National Soccer League (a professional league based in southern Ontario, Upper New York State, Quebec, and Michigan), with Toronto Ukrania. He also runs his Secrets to Goal Scoring course as part of his Golden Goal Scoring Academy.DeBenedictis has been a guest speaker on his topic at various National Soccer Coaches Association of America (NSCAA) coaching conferences. He spoke in Charlotte, N.C., in Baltimore, and most recently at the Jan 2013 Convention in Indianapolis to a standing-room only crowd. DeBenedictis has an Honors Bachelor of Science degree with a major in Physical and Health Education as well as earning an advanced certificate of coaching from York University. He also holds a senior coaching license. As part of his research into goal scoring for his course and this book, he interviewed and studied the careers of some of the world’s best goal scorers.